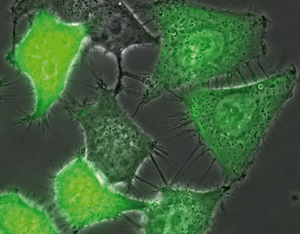 The μ-Transfection Kit VI is a unique combination of two elements tailored to each other in a highperformance kit permitting high-resolution microscopy of living transfected cells. 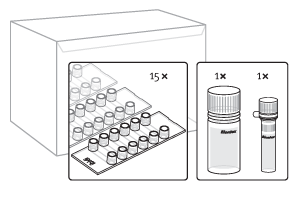 The joint kit comprises μ-Slides VI from ibidi and the reagent METAFECTENE® μ, developed by Biontex especially for this purpose. The kit enables cell transfection to be performed with both DNA and siRNA. The optimization procedure usually necessary in plasmid transfection is eliminated, while in siRNA transfection optimum knockdown is achieved with only three differing lipoplex volumes. The ultra-simple protocol provides for treatment of a cell suspension with lipoplexes and transfer directly onto the μ-Slides. The resulting effects can be subsequently observed in the living cells in outstanding optical quality (live cell imaging). 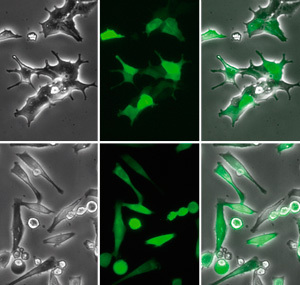 Examples of applications are tracking the expression and path of a fluorescence-tagged protein through the cell or monitoring the effect of knockdown of a gene.